With WordPress 3.6 expected to drop any day now, the next two versions of the world’s most popular CMS and blogging tool will be released before the year is out, according to WordPress co-founder Matt Mullenweg. WordPress co-founder Matt Mullenweg at WordCamp San Francisco delivers the State of the Word. Mullenweg also revealed more aggressive releases of future versions. WordPress 3.7 will be released in October and 3.8 will be out in December, with the 2014 theme planned for release by the end of the year. Work on version 3.7 will be led by lead core developer Andrew Nacin and will be an application-focused release aimed at stability and security. The release will feature better language packs, auto-updates for minor releases and password enhancements. Mullenweg pointed out a lot of that work had already been done as plugins. It’s the end of July and while we’ve seen teasers for the 2013 theme, it still hasn’t been released. “I just want a full year of a default theme, to be enjoyed for a year,” Mullenweg said. In his address, Mullenweg also revealed WordPress is now powering 18.9 per cent of the web, up 2.2 per cent points since last year. WordPress powers 18.9 per cent of the web. He also announced a new WordPress.org website, developer.wordpress.org for developers. As of writing this, the site is yet to go live. 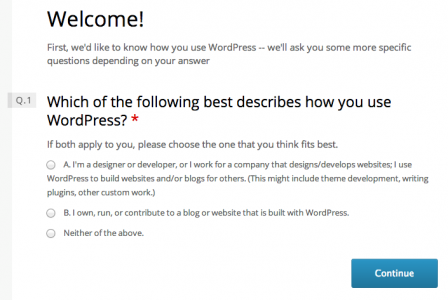 As in previous years, the results of this year’s WordPress Survey were revealed. A total of 30,000 people from 178 countries took part in the poll, which showed people enjoy WordPress for its ease of use and the community around it. Respondents said they least enjoyed plugins, followed by updates and security, with “nothing” even making it onto that list. A total of 98 per cent of people said they used WordPress on the web, with 31 per cent using the software on their iPad or iPhone, 30 percent on an Android phone, 18 per cent on an Android tablet and 12 per cent on a desktop app. A total of 20 per cent of people use WordPress as both a blog and CMS, down from 25 per cent last year. People are still primarily using WordPress as a CMS at 69 per cent, compared to 68 per cent last year. However, WordPress use as just a blog has dropped to 6 per cent, compared to 7 per cent last year. A total of 20 per cent of respondents said they used WordPress as both a blog and CMS, down from 25 per cent last year. Seven per cent of respondents use WordPress as an application platform. Mullenweg also revealed a 96 per cent attrition rate for people starting blogs. This year has been a busy year for WordPress and Mullenweg highlighted key achievements such as the 10th anniversary of WordPress on May 27. WordPress is adaptable like Lego, according to co-founder Matt Mullenweg. In his State of the Word last year, Mullenweg talked about WordPress as an application platform into the future, but today admitted “I think we’ve been thinking about this the wrong way”. He said WordPress was actually being used simultaneously as a blog, CMS and application platform at different levels. So far this year, WordPress has been downloaded more than 46 million times – that’s 147,000 downloads each day. A total of 336 themes were submitted to the WordPress theme directory – 2.3 times as many as last year. As for plugins, 9334 were submitted, with 6758 added to the plugin directory. The directory now contains more than 26,000 plugins. Mullenweg also talked about the development of the MP6 UI plugin and the removal of the two major features planned for version 3.6 – post formats and icons. Icons were pulled from the release in February and post formats in May. Work on MP6 has allowed the development of WordPress icons to flourish. He said the decision to remove icons early on allowed the development of that work as a plugin – MP6 – to flourish. The MP6 team has worked to weekly releases and, unlike other teams, Mullenweg said the developers had spent much of their talking about the plugin on Skype in private rather than publicly in IRC. He said this had allowed the team members to be more critical and experimental with their work. He said the post formats UI with the 10 icons at the top of the WordPress editor had not worked and would function better as a drag and drop feature that allowed multiple formats in the one blog post. “On post formats, we had to do it to know that it wasn’t what we wanted — it didn’t represent the original goal of simplifying,” Mullenweg said. Did you watch the live steam of the State of the Word, or were you at the event? Tell us in the comments below.